Attorney-General Vickie Chapman says it would be “appropriate” to co-operate if police launch a formal investigation into whether or not she breached the ICAC Act, but has ignored questions about whether or not she would stand aside in that instance. The Attorney-General has been under scrutiny since releasing a statement linking ICAC to a staffing issue at Renewal SA, with anti-corruption Commissioner Bruce Lander subsequently revealing he instructed her not to make any such statement, although he authorised media to publish it. Chapman, who is also currently Acting Premier, did the morning radio rounds today, during which she claimed she made her initial statement because “it was important to clarify the situation given the further inquiry at the time”. She spent yesterday fending off Opposition questions following a report in The Advertiser claiming police are conducting a “preliminary assessment” of available evidence to determine “whether a full investigation is warranted”. However, she did not address whether she would step aside in that instance. Asked to clarify her position today, her office referred InDaily to her media conference yesterday, in which she said she was “not going to speculate about ‘ifs’ or hypotheticals”. She told FIVEaa that “at this stage, at best we have an anonymous claim that there’s been a police assessment”. “Even if the ALP, the Opposition, sent materials to the police to look at it, any appropriate assessment should be undertaken by them, but that doesn’t mean we stop the business of the state and just walk away while they play games over in the corner,” she said. Penberthy himself has argued the issue is a storm in a teacup, suggesting it didn’t matter if the Attorney had breached the law because it was a “stupid law [that] has no bearing on anybody’s life here in SA”, and criticising Labor for pursuing the matter given “the ministerial standards it set in its own lengthy and chequered recent history in office”. Chapman says she has received “senior, comprehensive” Crown Law advice, which “indicates that there has been no breach”. On ABC Radio Adelaide this morning, she was asked repeatedly whether she had Lander’s authority to make her initial statement and refused to directly answer the question. “I quite accept that it’s reasonable for people to ask the questions, as they have in the Parliament or indeed publicly, but you know the same answer is there… what’s really important to me is that whether there’s, you know, a headline about a claim of a police probe, all those sorts of things… I’m available if the Police want to speak to me. Asked twice more, she said “obviously the implication of different aspects of what’s happened on the day have got to be dealt with in aggregate and I’ve dealt with it in aggregate”. “Because when you deal with these matters it’s a question of has there been a breach?” she continued amid further questioning. “We will always try and work, even with reforms, to make sure that we manage that,” Chapman said. She said she did not “have an issue at all” with Labor referring the matter to police, because politicians “have to be in the firing line, and we are”. 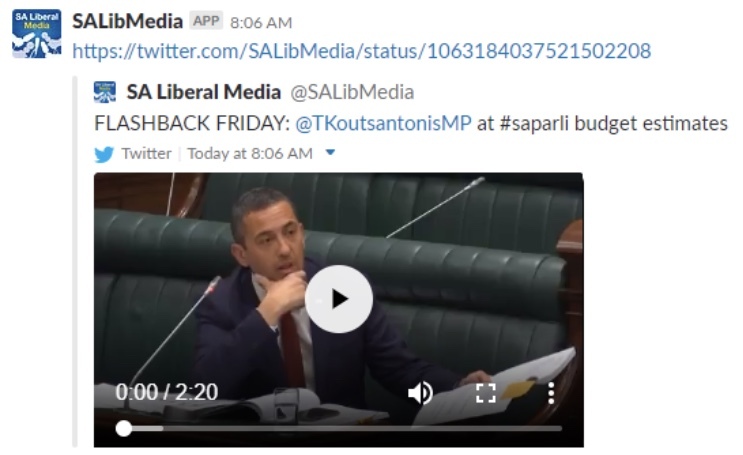 As she did the radio rounds, the SA Liberal Party’s social media account @SALibMedia tweeted out a clip featuring questions by Labor frontbencher Tom Koutsantonis during a budget estimates committee interrogation of Planning Minister Stephan Knoll. A screenshot of the now-deleted tweet. The tweet, which was swiftly deleted, contained dialogue that was not published in media reports at the time of the exchange, due to legal advice. Asked whether the tweet contained material that may have breached the ICAC Act, a Government spokesman said they would “not comment on the content of a tweet that was posted and immediately deleted this morning”.